Gog and Magog, the two mechanized wooden sculptures standing at the end to the Little Collins Street in the Royal Arcade, must be the world’s grumpiest looking bell ringers ever. Constantly surveying the pedestrians with their suspicious squints, the two giants of 7-feet tall strike the bells reluctantly every hour, like two bad boys being compelled to perform a much detested job that they couldn’t wait to get away from. The British legend claims that these evil pair were descendants of thirty-three wicked daughters of Diocletian (the Roman Emperor), who brutally murdered their husbands (so that they would remain subservient to no one), being punished with ostracism, subsequently populated a newfound island called Albion with the assistance of demons, and windswept the great land with a race of horrendous giants. And there entered the hero Brutus (the legendary founder of Britain) and his most trusted warrior Corineus; With joint effort, they successfully annihilated those dreadful giants, with Corineus hurling the last two- Gog and Magog- over the cliff. So the western part of the island came to be called Cornwall (named after the heroic Corineus), whereas Brutus travelled to the east and founded the great London we know today. 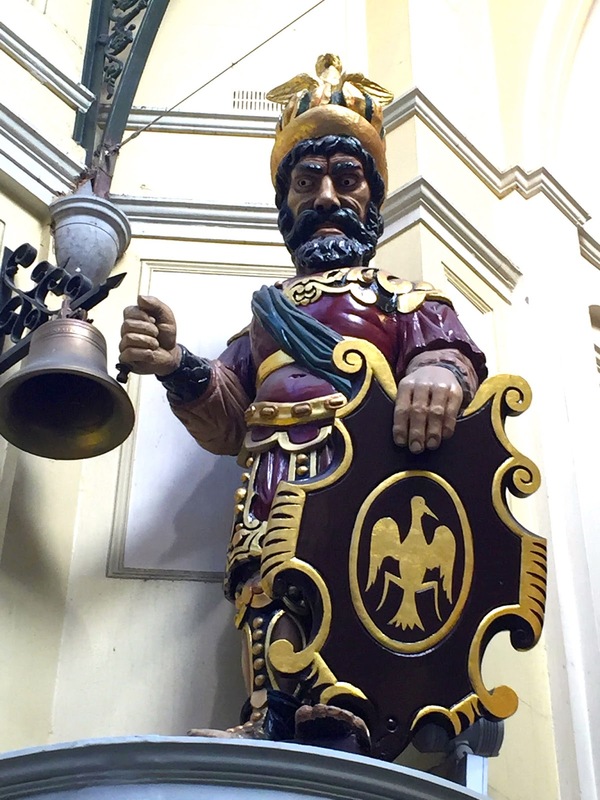 The names Gog and Magog are also mentioned in various Jewish, Christian and Muslim scriptures, all making reference to the pair as symbols of all things evil and ugly. They are the “barbarians” to the Jews, the ones who “do great mischief on earth” to the Muslim, and the ones who will “one day rally with Satan” to the Christians. 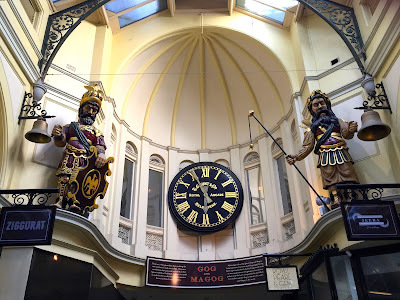 So with such hideous and infamous background, you might wonder why the two figures could be seated so proudly at the London’s Guildhall, and a replica of them are placed at this oldest arcade in Melbourne as trusted timekeepers since 1892. 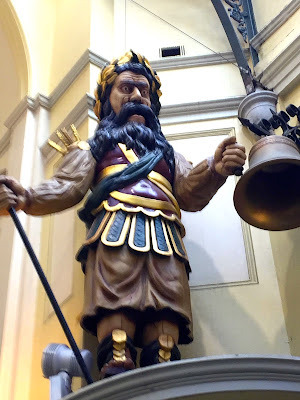 Perhaps it was their symbolized strength and force, being the two last-giants-standing defending the land; or perhaps it was their rather obscure origin to which most of the immigrated Melbournians can easily relate with. Or maybe it was their macho appearance, or their bad-boy image of always being the “evil other”, the foes of all races that somehow intrigued the adventurous early settlors in Victoria. 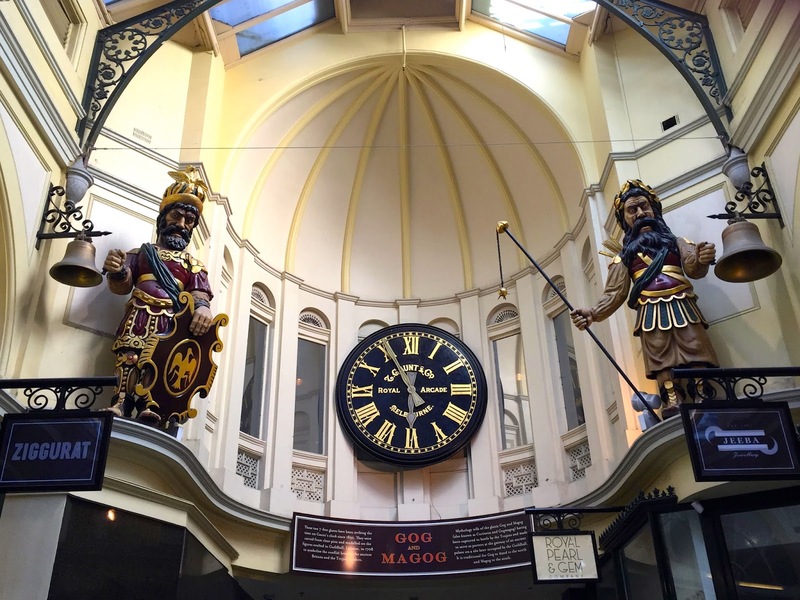 Regardless of the true reasoning, these adorable Gog and Magog sculptures will remain as one of the dearest landmarks in Melbourne that will continue chiming the magnificent Thomas Gaunt’s clock at each hour faithfully (albeit, grudgingly).